Most of us are familiar with the white and yellow line markings on UK roads. Some of us however may wonder exactly what those red lines called red routes mean. New drivers or foreign drivers in the UK often ask what are red routes and when were red routes introduced? Red routes were introduced in 1929 in London to aid in alleviating traffic congestion. The red single or double red lines are placed on major arterial roads and generally impose stricter rules and regulations for stopping or parking than the more frequently seen single or double yellow lines. 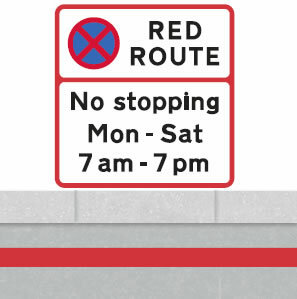 This section explains the difference between single red lines, double red lines, red route parking, stopping and the Penalty Charge Notices (PCN) fines associated with parking on double red lines. Red routes use single and double red lines just the same as the single or double yellow lines. Although red route rules are similar to those of the yellow, red route rules are often vehemently enforced which results in many thousands of PCN fines being issued each year. Red route double red lines means no stopping at any time, even to drop off or pick up passengers. Red route single red lines have restricted stopping times that are displayed on the sign adjacent to the line. Unlike double yellow lines, there are virtually no exceptions to red route parking on double red lines. 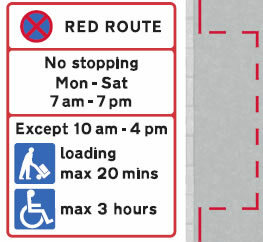 No stopping, waiting, loading or picking up or setting down of passengers is permitted on red route double red lines. Licensed taxis are permitted to drop off and pick up passengers on red route double red lines and disabled blue badge holders are permitted to pick up and set down disabled passengers on red route double red lines. You are permitted to park on single red lines outside of the times displayed on the sign. Based on the single red line sign displayed, you may park here overnight from 7 pm through to 7 am and all day Sunday. If stopping restrictions are in force, the restriction applies to the whole road, including the verge and footway. Single red line restriction times are shown on upright signs that face oncoming traffic. Unlike yellow lines, disabled blue badge holders must not park on a red route. A driver of a vehicle displaying a blue badge can stop to pick up or set down a disabled person only. Penalty Charge Notices (PCN) are issued to motorists that do not conform to the rules restricting them from stopping in a red route double red line area or if within the restriction times displayed on signs. Red route rules are upheld strictly and many thousands of PCN are issued each year through CCTV alone. A PCN ticket can also be issued by local police traffic wardens, or the council’s own parking attendants. A red route parking fine is usually £100 – £130 and if paid within a certain time shown on the ticket, a discount will apply. This is usually in the region of 50% and if the fine is not paid within this time-frame, the full amount will be required to pay. 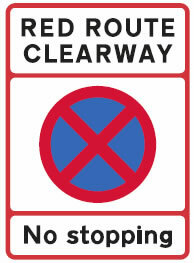 Certain red routes have upright signs without any road markings. 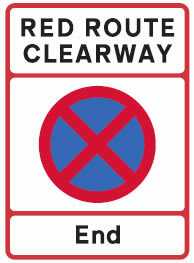 These are designated “RED ROUTE CLEARWAYS”, where stopping for any purpose is prohibited at all times, except in designated and marked lay-bys. Unlike rural roads with 24 hour clearway in force, it is prohibited to stop on a red route clearway on the main carriageway, the verge and the footpath. 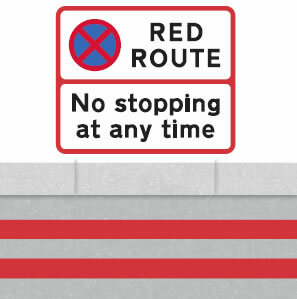 Motorists entering the red route area from a side junction will be met with red junction lines to indicate they are entering a red route area. Red route parking bays along the road are provided in certain areas for parking or loading. Red route parking bays are marked with a broken red or white line and the conditions that apply to each bay is indicated on upright signs that should also face oncoming traffic. 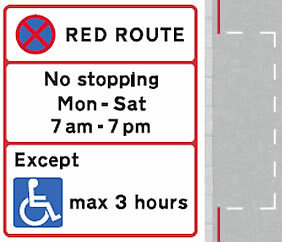 A red route bay marked with red broken lines indicates that it is available for use for only part of the time that the red route “no stopping” rule applies. In this sign, the bay must not be used from Monday to Saturday between 7 am and 10 am and also not between 4 pm and 7 pm. In this example, the bay may be used for loading or unloading (max stay 20 minutes) and by blue badge holders (max stay 3 hours), during the times shown in the bottom panel. A bay marked with white broken lines means that it is available for use at all times that the red route “no stopping” rule applies. The upright sign shown in this example means that the bay is reserved for blue badge holders, with a maximum stay of 3 hours and can use the bay at any time. When you feel confident in your ability to understand road markings and lines, take the free road markings theory test quiz and test your knowledge. Yes sure, providing there are no other parking restrictions on place. what are the restrictions on single red routes, can I park on the side of the road that has a single red line? You are permitted to park on single red lines outside of the times displayed on the sign.